While rates spiked in mid-March, they then dipped, with their lowest point of the year coming just a month ago. However, once the Fed met in mid-June and announced that the funds rate would rise again, they’ve been steadily increasing for the last month. 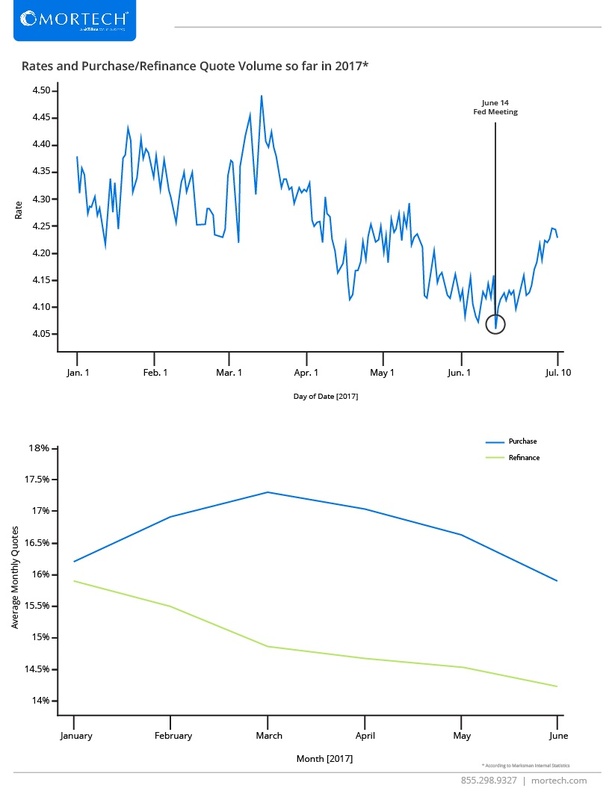 Despite rates dipping from March to June, the number of purchase and refinance quotes decreased over that same period. While rates were at their highest in March, that was the same month in which purchase quotes were also at their highest. We’ll be keeping an eye on this data for the second half of the year to see how these trends play out, and you should be keeping an eye out on how your mortgage business processes as we move toward the end of the year. Fortunately, Mortech makes it easy – simply contact us for a free demo to learn what our mortgage pricing engine can do for you.